That conversation uncovered some real beauty that really must be shared. Of course, I have an affection here, because whales first arose in India. What follows is a technical discussion, but you might enjoy reading this book. even if we accept some of the fossils as “intermediates” between whale and land mammals, there is not enough time for the complex adaptations needed for whales’ fully aquatic lifestyle to evolve. Whatever the correct explanation is for the origin of whales, unguided evolutionary mechanisms are not the answer. First of all, I should point out that I do not argue for “unguided” evolution (about which I am agnostic), but I do argue against bad arguments against unguided evolution. Instead, I affirm evolution as God’s providential governed way of creating us all. So the “unguided” point is really beside the point. If there is a very unlikely set of events required to evolve whales, I’m not sure how we could know, based on the evidence we see. That does not, however, negate God’s providential governance of all things. This is a really beautiful review, bringing together a vast amount of excellent work to untangle the history of the beasts of the sea. It is remarkable how many of the changes required for whale evolution are caused by loss of function mutations (which end causing “pseudogenes”), or small tweaks to proteins. This is one of the big surprises of mammalian evolution. Large changes can take place with tweaks to the genetic code. Eyes adapt to underwater vision by losing a rhodopsin gene. Hind Limbs are lost with the loss of a homeobox gene. Taste buds are lost when two genes are lost. Smell receptors are almost entirely lost in most species too. In all these cases, we see remnants of the broken genes, and in many cases the details of how these losses increase function are well understood. Remarkably, it does not appear any new enzymes or de novo genes are required in whale evolution. It appears that small tweaks to existing proteins, or loss or alteration of the function of existing genes, account for the changes we see see at this point. Also, there does not appear to be any reason that a large number of these changes must happen at the same time. They appear gradually in the tree, and its not clear at all why they would need to be “coordinated”. They do not appear to need to occur at the same place and time to be useful. So this does not make these transitions unlikely. Also, we also see convergent mutations between whales, bats (echolocation), and beavers (diving adaptations to blood). These “homoplasies” are the rare exceptions to the nested clade pattern of common descent, and are exactly what we expect in evolutionary process, just like we see recurrent mutations in cancer, and convergent evolution in human HLA variation. Everyone agrees that human variation arises by natural processes, and that cancer arises by natural processes, yet we see homeoplasies here too; this is what we expect from common descent. We have to commend Dr. Wise for following the evidence here. However, I think this process still needs a few million years to take place. 4,000 years is not enough. To be clear, we have certainly not mapped out all the mutations required. There sill remain a lot to understand. However, there is no reason to think these patterns will change. For whatever reason, it really looks like whales, hippos, chimpanzees, and all of us share common ancestry. Whether or not its true, that is how our genomes look. And so, does my analogy to the rapid development of a hyperactivated, crenellated human neocortex based on a “small tweak leading to a large morphological change” make any more sense, in light of this example? The fossils we possess in the lineage of whale evolution might suggest a gradual change, but, in truth, the physical specimens we do have for this blowhole transition is aptly termed “abrupt” and “sudden,” even by cetacean specialists themselves. In theory, for example, why would the complete loss of cetacean hind limbs HAVE TO take more than one specimen? If it leads to much better locomotion, only a few descendent generations might be enough for a permanent instantiation of this morphological novelty, enough to set the stage, through outcompetition and interbreeding for all prior “versions” of this species to slowly disappear. The analogy seems sound enough to me… ? And yet, you know that “small tweaks to existing proteins” are often the result of enzymatic catalysis, and perhaps, even, in the breaking of genes. As to the notion of “new” enzymes, they need only be new to the species exposed to them to do this kind of work. Seems like I’m swimming upstream with you for some other reason I can’t account for. Suffice to say, I am not arguing against common descent, only against the assertion that such heuristic, abrupt changes are unguided or unanticipated by God. The abstract seems clearly to be descibing the gene in question as a type of “pseudogene,” viz. a partial duplication of a sister gene. Yet, its morphological effects are profound. Remarkable how remarkably well this analogizes to your remarks above, wouldn’t you say? Or, am I a such a complete nincompoop as regards the science that your laughter may be more “at me” than “with me?” Either way, thanks for all the remarkable engaging! Well you sound giddy about it, and I have had that same feeling from time to time when something came together. I don’t want to be a downer, but I would be cautious about taking this before creationist groups just yet. Now you have seen the whole paper and I have not, but just from what you wrote I see a lot of cherry-picking going on. That is, they are focusing on the changes where there is a loss of function and no functional intermediates required to suggest that the whole organism came about by such trivial changes when in fact other changes had to occur which almost certainly do not fit these parameters. Do they really hand-waive past echo location as much as your synopsis seems to suggest? Losing hind legs, yes that is easy to explain as a lost of function with no intermediary. Echolocation? Not so much. Nor the unique physiology required to nurse young underwater. Nor baleen teeth and the changes needed in order to feed in that manner. In addition somewhere between Rodhocetus and Dorudon the swimming motion of the tail would have to make a 90 degree turn. Apparently Rodhocentus most resembles Desmans in skeletal structure. They don’t seem to use the motion needed with flukes either. 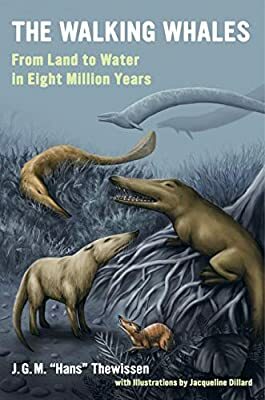 And that raises another question: If we can go from something like a Desman to a baleen whale in eight million years then why haven’t we seen fairly significant jumps in historic times? Desmans could presumably benefit from echolocation too. Perhaps Manatees could as well. We should be catching transitions like that going on now from the historical record, or say from the Ice Age until now. Sure 5K years is a blip compared to five million, but shouldn’t we catch a new family or two popping up in fast breeding populations with many offspring and short life-spans if whales can evolve this fast “naturally”? No friend, I sense that something is missing here, that there is information which came from somewhere which drove these changes at a rate and in a way that the natural universe would never have achieved on its own and earth is not replicating now. If you had 100 billion earth-like planets and no intelligent guidance to mediate and nurture the course of life on them, would any of them even get life? Or, if you put the simplest of cells on them all, if you spotted them that, would any of them ever of their own volition produce creatures like whales, or butterflies, or Marilyn Monroe? If you say that it would, is that something you can demonstrate scientifically? If not, how can science say that the process of filling the seas and land with one set of amazing creatures after another was done in such a manner? Well you sound giddy about it, and I have had that same feeling from time to time when something came together. I don’t want to be a downer, but I would be cautious about taking this before creationist groups just yet. This isn’t directed at creationist groups. It’s just a cool paper. I was loving what I was learning. As for the rest, much of what you are concerned about is directly dealt with in the paper, in detail. Consider the post a pointer to the paper, not a replacement for it. That is exactly what I am talking about. Small tweaks to proteins have large positive effects. And an interesting response from ENV. I do want to point out the professional tone, which I appreciate. The professional tone is indeed welcome, if a bit different from their usual posts. There is no good reason why brothers and sisters in Christ should take pot-shots at one another from the distance spanning the two different viewpoints on life origins and development. I would like to add, however, that Jones’s arguments are more effective against random, guideless (and Godless) evolution than against a viewpoint of evolution as a tool of the Creator. The oldest known whale to ply the Antarctic may suggest whales evolved faster than thought, researchers say. but it doesnt prove any evolution. so even if all those fossils were in the correct place its still not be a good evidence for evolution. now, we can say that cars cant reproduce with variations like creatures. but even if cars were able to replicate or were made from organic components they still be evidence for design. lets say that we will have a self replicating car. can such a car will be able to evolve stepwise into a submarine? I find your observations interesting, and I will look forward to seeing what others think about them! Can you find the original paper for this? I cannot find it anywhere. How does the anatomy of that whale compare with the rest? What makes you think this is evidence against evolution? Even in your figure, we can see that we expect some whales to be found that early. This is not the strongest evidence for evolution. However the fact that we can do this certainly undercuts arguments against evolution. It seems that we see a progression of forms in the fossil record. There are many transitional forms. I know nothing of self-replicating cars. We are talking about biology. The latest ENV post makes the same mistake, in thinking in only “either / or” terms. While the rise of useful new genetic information can hardly be ascribed to chance, neither can the fact that natural selection goes ummediately to work “against” the novel gains in function from new information be ignored. That is, once novel information comes from an “intelligent Source,” it takes its place in very real develoment of morphologies, and thus, species over time. And to be clear, even if the date was at 49 mya, that would not be a significant problem. if we can find such an order in designed objects too (without a common descent) then fossils cant be evidence for evolution either. its just an analogy that show why it will be near impossible to change one form into a different one by small steps. this is why i used a self replicating car. basically according to evolution if the object is able to replicate with variation and natural selection then we can get a big change during millions of years. its also important to note that even in this case a self replicating car need a designer. so why not a self replicating creature? If you knew there was uncertainty about the Basilosaurid jaw and that the authors revised the date why did you even bring it up as 49my? Or were you unaware of the most recent work on it? If you were aware, it comes off as dishonest on your part. I’m going to give you the the benefit of the doubt and assume you were unaware. It’s also a total non-sequitur that because we can adjust timelines that means no fossil can be problematic for evolutionary theory. As far as the Tikiguania paper, I notice you left out what precedes the passage you posted. That’s an excellent paper. It shows how science works. You don’t discard a theory or a pool of data because of one anomaly. You try to explain it in a way that’s consistent with the overall data. This is what they did. They formed a hypothesis and found independent evidence for that aux hypothesis. Beautiful work.